Every website you create has two default pages that can be customized; Home and Contact. Besides, you can add more pages as per your need. Just click on the respective buttons on the left of your builder and you can add, open or save pages. 1. 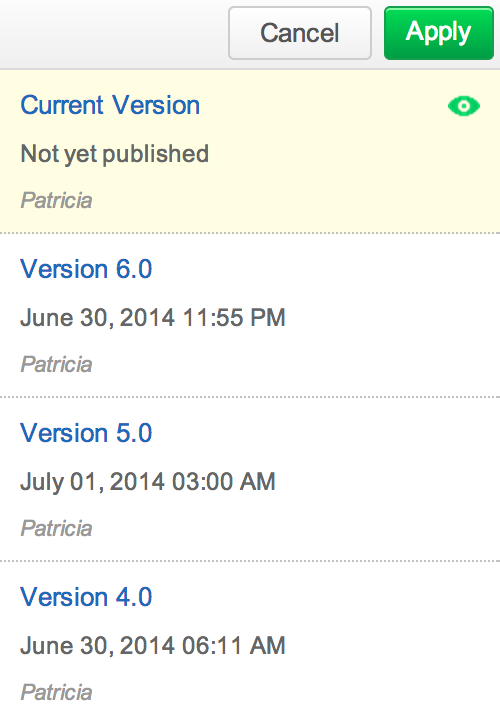 Click on &apos;New&apos; to add pages to your site. 2. Page names are important and can be very rewarding when optimized. Specify an appropriate name for the page. This can be changed later. Though it is not advisable to rename pages after publishing a website. Most orderly pages focus only on one topic. That topic you talk about is the keyword (or key phrase) for that page. If the page name contains these words, then it will be present in the URL too, which is highly advantageous on SEO grounds. If you feature "wildlife photography" on a page, it should be optimized for the words, wildlife and photography, and the title of the page should contain "wildlife and photography". 3. You can also make the new page as a sub-page to an existing page. An existing page can have any number of sub-pages. 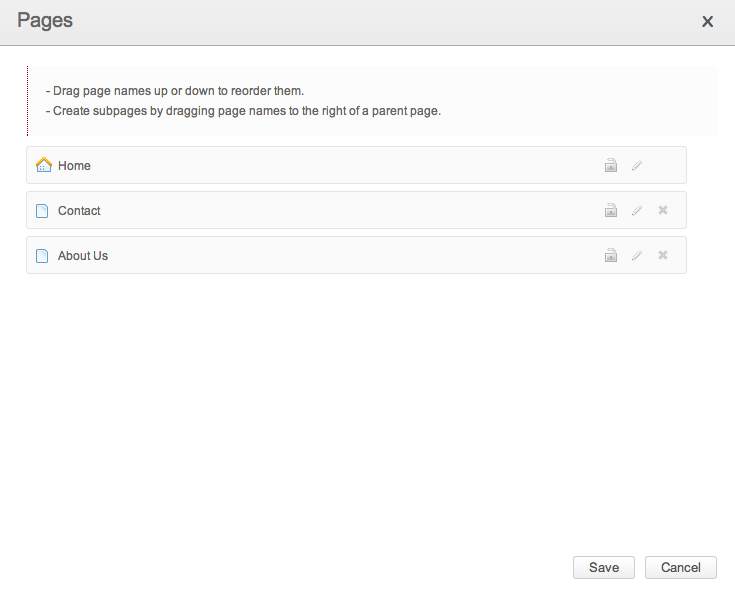 If you want the new page to be primary, just select &apos;None&apos; on the Parent Page drop down box. 4. 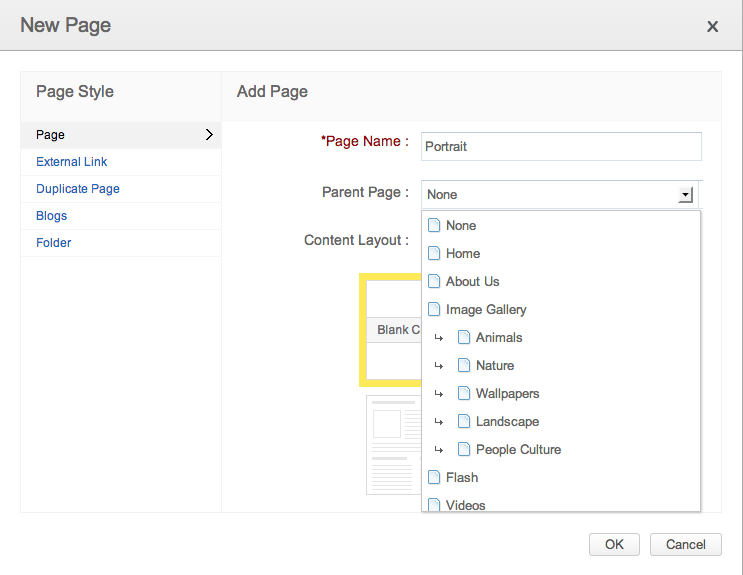 Use one of the predefined layouts for your new page if you wish, or create it blank and manually add the needed elements. 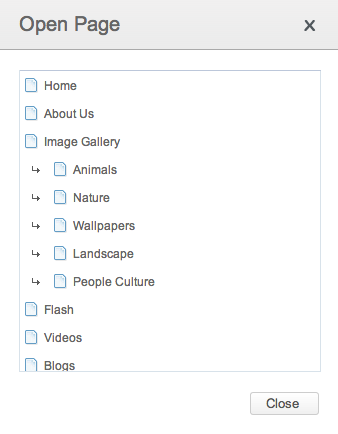 The &apos;Open&apos; option can be used when you want to view the list of pages created in your website. The 404 page will also be listed in this screen and you can open it and customize it as per your preferences. Although Zoho site builder is designed with auto-save option, which will automatically save your work when you close the browser tab, we have also provided the option to manually save your work. All you need to do is click on the &apos;Save&apos; button in the toolbar and your work will be saved. Pages can also be managed i.e. they can be reordered by dragging up and down or can be made subpages by dragging to the right of parent page. 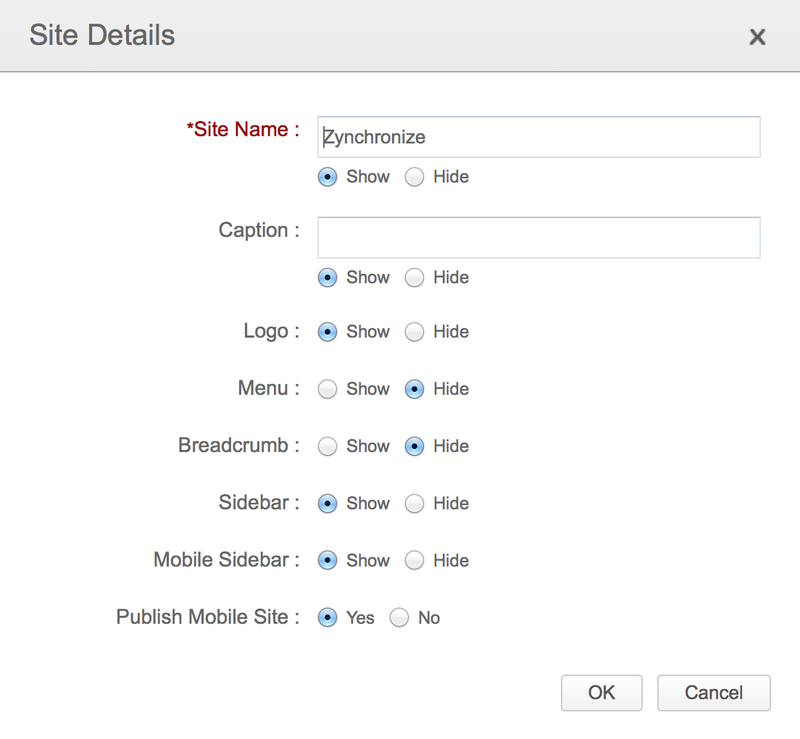 Go to the site option on the top right corner of your builder page and click on manage pages. Even if you make constant changes and re-publish your website, we provide the option to view the content of your website before making the changes. Go to Page Options > Page Versions and all versions of your webpages would be listed there, which you may view or switch to, any anytime. In addition to logo, breadcrumb and sidebar, you can now hide navigation on your website. It hides all pages in your website and showcases only the home page. 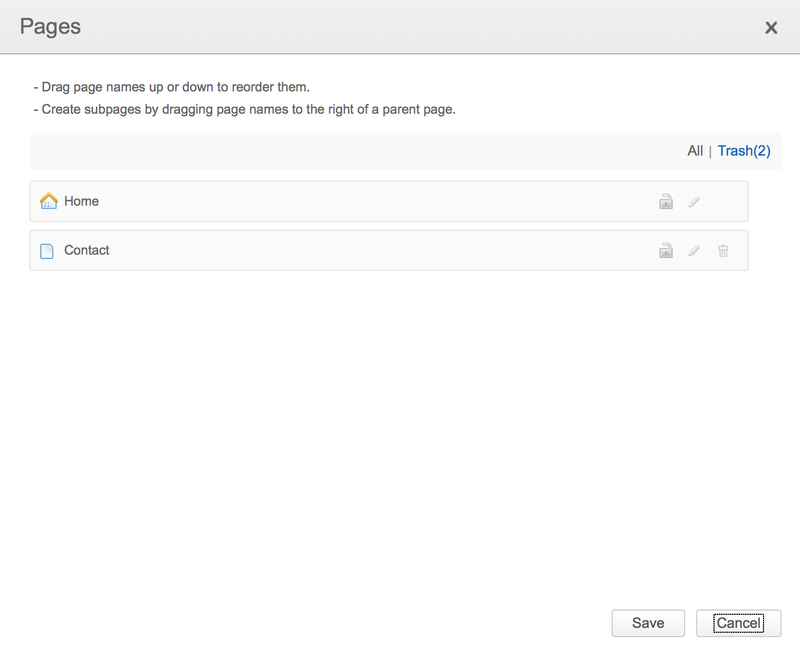 To hide the menu, go to Page Options > Edit Page Details and set the menu to be hidden. Now every page edit that you discard and delete, gets preserved in the trash and you can anytime retrieve them. To retrieve them simply go to the manage pages under site option and click on the trash in the tool box. You will see the list of page in the trash and you can selectively retrieve them.